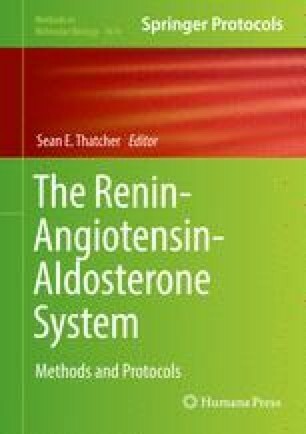 Dysfunction of the renin-angiotensin-aldosterone system (RAAS) has been implicated in the etiologies of many cardiovascular diseases, including aortic aneurysm. In particular, the infusion of angiotensin II (Ang II) in the apolipoprotein E-deficient mice (apoE−/−) and low density lipoprotein receptor knockout mice (LDLR−/−) to induce aortic aneurysm has been extensively used in the field. In contrast, whether aldosterone (Aldo), an essential component of RAAS and a downstream effector of Ang II, is involved in aortic aneurysm is largely unknown. Here, we describe a new animal model for induction of aortic aneurysm in mice in which administration of deoxycorticosterone acetate (DOCA) and high salt or aldosterone and high salt, but not DOCA or high salt alone, to C57BL/6 male mice can potently induce aortic aneurysm formation and rupture in an age-dependent manner. This new aortic aneurysm mouse model is different from Ang II infusion mouse model and exhibits several unique features that mimic human aortic aneurysm. This work was supported by NIH grants HL106843 and HL125228 (to M.C. Gong and Z. Guo) and VA Merit Award BX002141 (to Z. Guo) as well as a National Institute of General. Medical Sciences grant (P20 GM103527-05 to L. Cassis).